With error handling, and a basic logging functions, the whole process is less than 100 lines of code. Without comments and logging, it's less than 50 lines! The application performs a the following basic steps, the same as my previous tutorial, but without any interaction. These are outlined below. Once I discover why this is the case, when Promises should stop this from being necessary, I'll provide a further update. 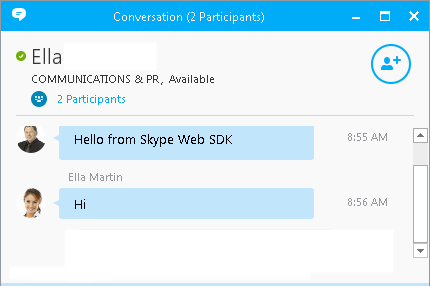 This issue may also be resolved in future versions of the Skype Web SDK. You can use promises in a number of different ways. You can chain promise operations by calling then or done on the promise that is returned by the previous then function, which is what I have created below. Below is a conceptual view of the code and how the promise logic works. Once we have actually sent the message using the sendMessage function, I then call the chatService.stop() method and the signOut method. Neither of these are chained, as I'm not worrying about error checking at this stage - our message has been sent, which is the objective of this tutorial. For a more detailed explanation of each function, see the first part of this tutorial. // that will be used to send the Instant Message. Throughout this tutorial, I’m reporting status and updates via a log() function, instead of using the alert() function. Aside from being annoying when it pops up a message, alert() is not overly flexible. Instead, my log() function simply prepends the text message to a DIV, with the current time stamp – very useful for debugging and seeing activities in real time. There’s also a simple padLeft() function that pads time references with 0’s where they are less than 2 digits long, to make them nice and consistent. I've also implemented a pause() function, which is passed a value representing the number of milliseconds to wait. As mentioned above, this is used to briefly pause between SDK calls to improve reliability.